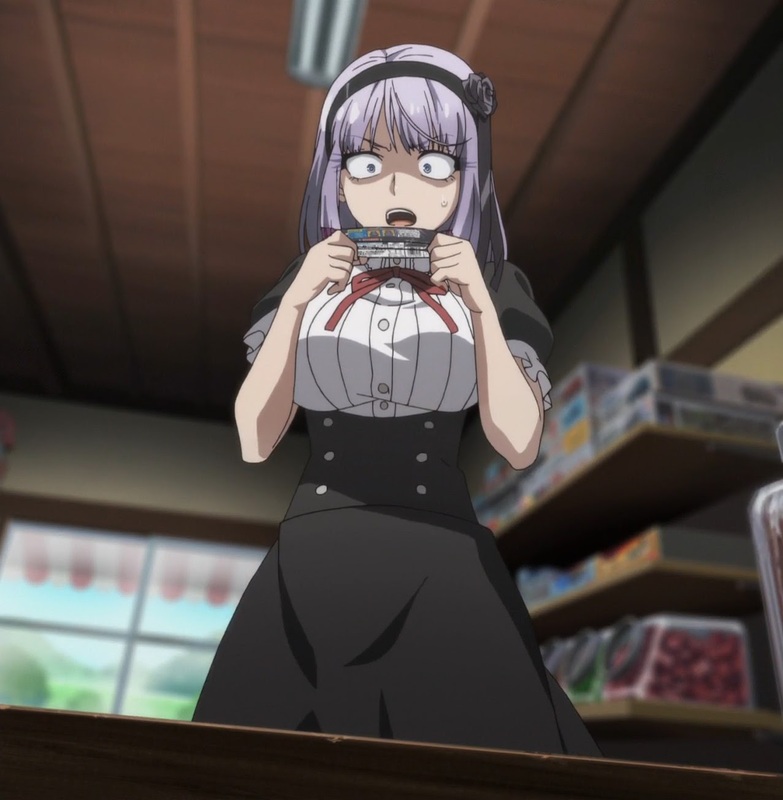 Hotaru needs a sugar fix. Kokonotsu records a candy review video. Hotaru tries to win a candy prize. Episode 5 - "Bottled Ramune and Baby Star Ramen and..."
"Yay! Ramen and Beware the Sour Grape and..."
Fanservice took a backseat to comedy this week as Hotaru and Mr. Shikada made jokes about the addictive nature of sugar, Kokonotsu showed he was just as passionate and knowledgeable about snacks as Hotaru and we learned Hotaru is a total loser when it comes to lottery contests. I learned a couple things while watching this funny take on making sucking pure sugar out of a candy bottle look like taking drugs. I was under the impression that "ramune" was a juice, but it's actually a flavor. It's how the Japanese have appropriated lemonade flavoring. So "ramune" can be a soda flavor or granulated confection flavoring. This bottled ramune is basically Pixie Stix, except you can also eat the bottle later. Second, Kokonotsu's dad is eating his profits, literally. Like a drug pusher shouldn't be using his own product, a candy store owner should not be keeping a certain candy off the shelves just so he can "use" it for himself. Hotaru really punched up the drug pusher jokes by playing off the addictive nature of sugar and pressuring Kokonotsu to take his first "hit." It is a bit salacious for an older man to meeting a high school girl late at night, so there was that aspect of the whole suspicious behavior scene to flesh out the jokes. Obviously, Mr. Shikada just walked Hotaru home instead of seeking rehab. Tacked onto this scene of illicit powder abuse was Kokonotsu becoming an online video snack review star. I liked how Hotaru shared the video with Saya and Saya wanted to see more of Kokonotsu. This little scene was a nice reminder on Saya's crush. 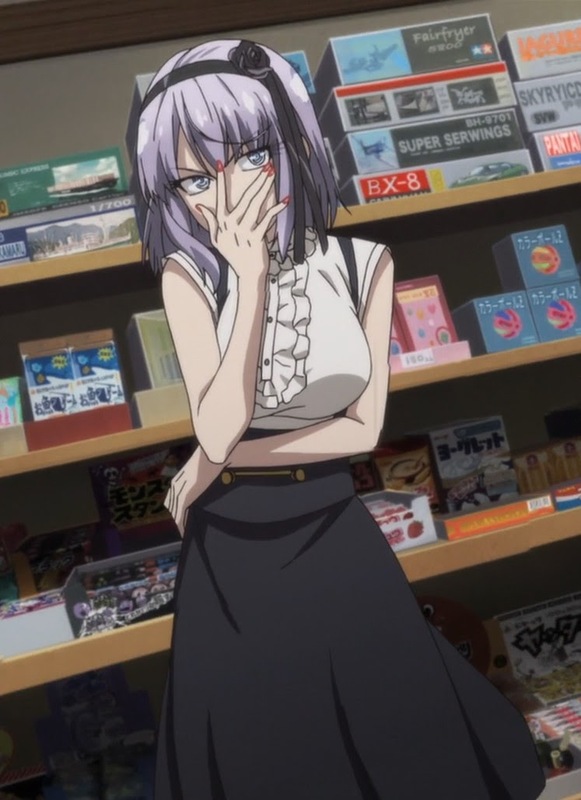 Also, I noticed that Hotaru didn't wear some kind of red necktie with her outfit. Going casual? Aw. I missed Hotaru slamming open the sliding door this episode. Her femme fatale pose was a nice alternative, though. I think it kind of helped open the next round of jokes about trying to win the candy lottery and gambling. We learned that Hotaru has terrible luck and part of her irrepressible personality is always doubling down on that terrible luck. Part of the shtick capitalized on how superstitious Japanese young people are. They're always looking for some outward sign to predict a future outcome. It goes along with believing in all kinds of rumors and conspiracies too. 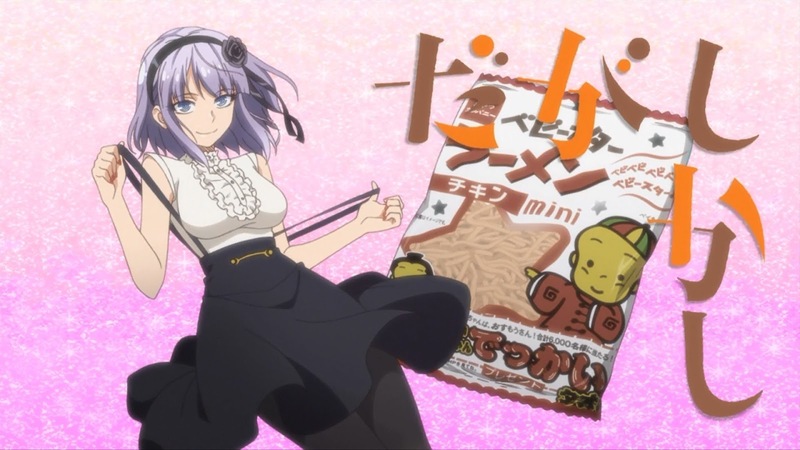 At least Tou got a big bowl of ramen out of Hotaru's losses. 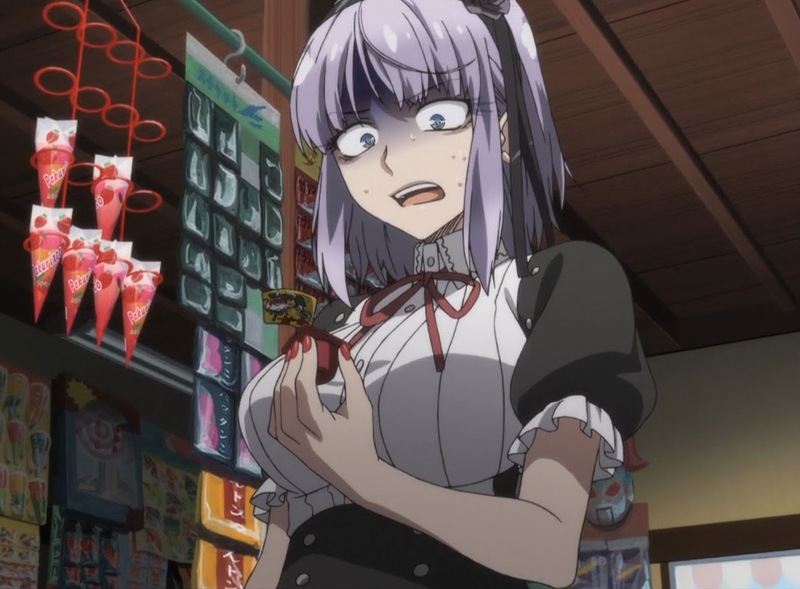 And going along with her doubling down, Hotaru decided to come back to the whole point of why she's still in the village - challenging Kokonotsu on picking the sour ball for the wager of taking over the candy store. There was a nice bit of foreshadowing to get to Hotaru's utter defeat. 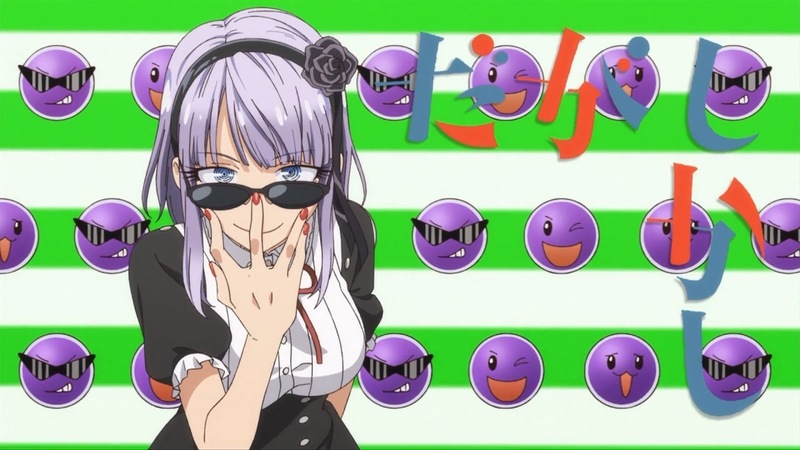 Seeing Tou's sunglasses almost made her remember that the Sour Grape candy had changed its packaging. But even then, she still believed in the rumor that wherever the sunglasses wearing ball was on the packaging told you where the sour grape was. After all the evidence of the Yay! Ramen letting her down, she still believed! It's a good thing she ran away before Kokonotsu remembered he needed to collect on his bet. Maybe then this episode would have turned back towards its fanservice sensibilities instead of concentrating on comedy. 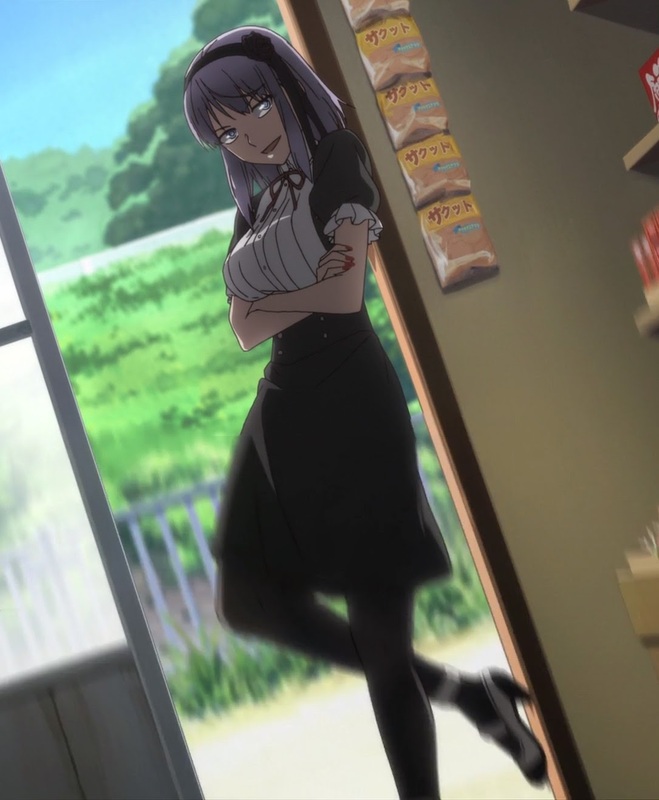 Kokonotsu is pretty strange too, just to accept Hotaru's terms for the wager. However, as the sane one, he took the safe bet in seeing her lose. What a sourpuss she was!